The Trendy Sparrow: Office Decor Inspiration + Big News! Office Decor Inspiration + Big News! So...I have some pretty exciting news to share with you all! As some of you know, I recently moved into a new 2 bedroom apartment in August because my old one bedroom apartment was too far for the business. I was beyond thrilled to finally have an office space that was all my own and out of my bedroom to grow the company. Well guess what? I've outgrown it. The bedroom sized office is already too small for The Trendy Sparrow store as it continues to grow! Isn't that amazing?! The best part is...I am getting an office space. Like...a real one! I'm really thrilled about it, and I'm excited to get to decorate it! I'm still keeping the second bedroom in my apartment as an office for me, but the new office space will be for packing orders and working on products and more! While my home office will be more for blogging and computer work. Now that I have two offices (seriously...is this my life right now??) I have even more space that needs to be decorated! I have an affinity for office decor as it is...can't I just decorate every room like it's my office? 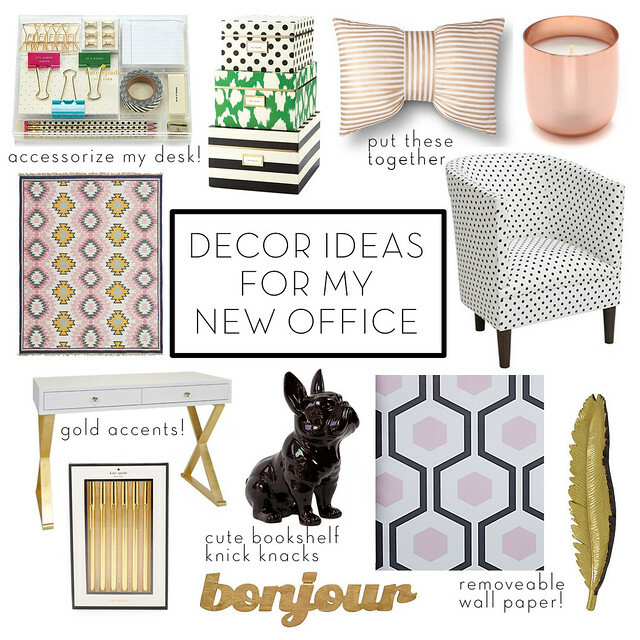 Here are some of the items that I am majorly crushing on for new the office! Okay you guys....here is my new office! I know it seems so plain right now...but, hey, they are still building it. That's my new office baby you are talking about! I love that I'm getting to decorate something from the bare bones.